MSM 1,000mg Tablets – At KALA Health, Inc. we believe your MSM tablets should contain the highest quality, licensed MSM, and deliver the full 1,000 mg per tablet that is demanded in the market to-day. 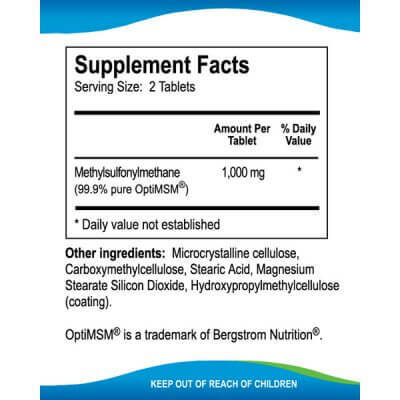 OptiMSM® is the world’s purest methylsulfonylmethane (MSM). 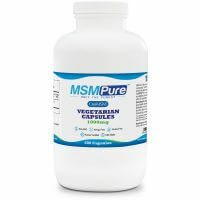 MSM is an organic sulfur-containing nutrient that supports healthy active lifestyles by providing nutritionally essential sulfur and methyl groups. KALA Health, Inc. uses an advanced compression technology which produces smooth, easy to swallow 1,000-mg coated tablets. We then dry-spray our tablets with a clear vegetable coating to make them completely taste-free. 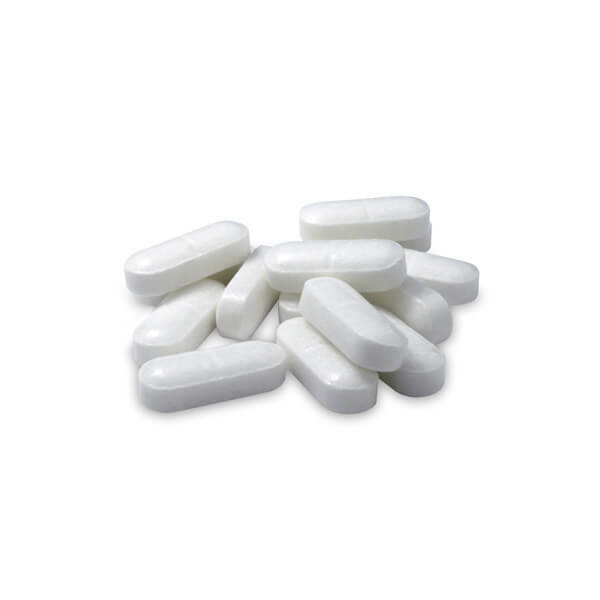 Our coated tablets are thin and very easy to swallow, yet dissolve readily in water. 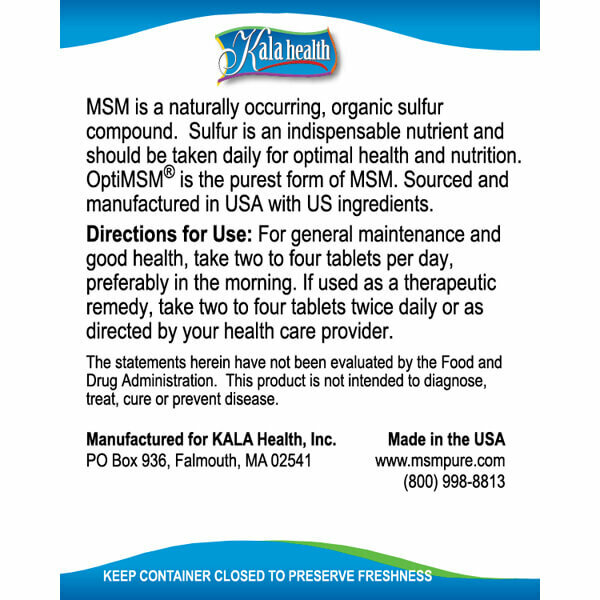 Other MSM tablets may contain as much as 30% additives, but the advanced tabletizing technology employed by KALA Health ensures a total of less than 5% of inert ingredients which are always added in tablets, including flowing agents, an anti-caking agent and an agent to adjust tablet hardness. These ingredients are completely safe, inert, and standard in any tablet: without them they cannot be produced. 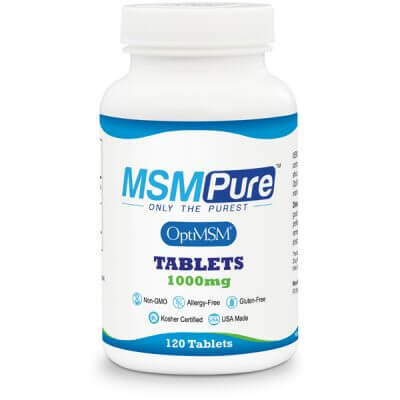 Stanley W. Jacob, M.D., former Medical Director of Bergstrom Nutrition and the world’s leading authority on MSM, has exclusively recommended OptiMSM® in his 35 years of practice treating thousands of patients with MSM. Dr. Jacob has published over 150 articles scientific and medical articles as well as , several medical text books about MSM, including The Miracle of MSM: The Natural Solution for Pain. Other ingredients: Microcrystalline cellulose, Carboxymethylcellulose, Stearic Acid, Magnesium Stearate Silicon Dioxide, Hydroxypropylmethylcellulose (coating). 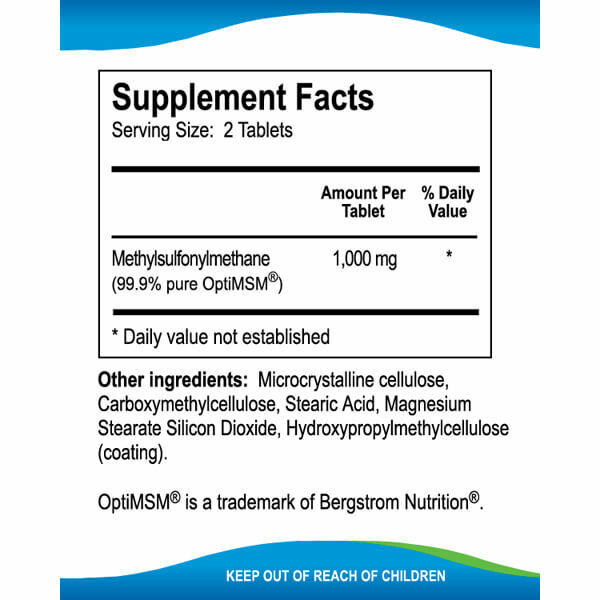 MSM is a naturally occurring, organic sulfur compound. Sulfur is an indispensable nutrient and should be taken daily for optimal health and nutrition. OptiMSM® is the purest form of MSM. Sourced and manufactured in USA with US ingredients. Directions for Use: For general maintenance and good health, take two to four tablets per day, preferably in the morning. If used as a therapeutic remedy, take two to four tablets twice daily or as directed by your health care provider. The statements herein have not been evaluated by the Food and Drug Administration. This product is not intended to diagnose, treat, cure or prevent disease.